Migration to Beta Blogger Imminent! ~ The Blog Doctor. You are here: Home > Upgrade > Migration to Beta Blogger Imminent! Migration to Beta Blogger Imminent! as per a reliable inside source. Beta Blogger debuted on 14 Aug 2006 and is now fast approaching the final stage. You will get warning before it's time to migrate over to beta. However, that time is coming up sooner than you expected. This blog is to help newbies to blogging and those who are migrating have a smooth and satisfying experience. Feel free to comment, contribute, rave and rant by clicking on 'COMMENTS' at the bottom of every post. Reader feedback is essential to make this THE definitive site on Beta Blogger. 1) First Backup your Template as described in How to Change Template. 3) Backup your Comments by setting their settings to send you an email everytime a comment is posted. Then you have all your comments backed up as emails. 4) Make a Test Blog in Beta to see all its features. 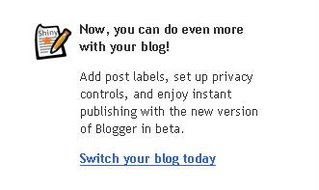 5) IMPORTANT NOTE : After migrating to beta you cannot go back to Classic Blogger. Your Blogs and Profile will remain the same. You can however choose not to upgrade to a beta or Layout template. Then you will have a Classic Template in the New Blogger. You will not be able to use widgets or page elements if you have the Classic Template. Check out the differences between Layout and Classic Templates. 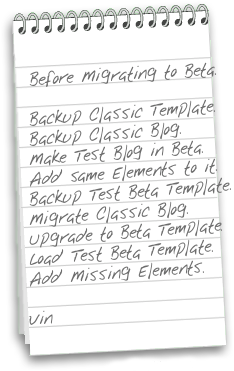 MIGRATION is the first step and then UPGRADE to a beta Template in the second step. there you will find a link to Upgrade to a new beta template. Without this template you will not have most of the new features of beta like Layouts etc. See picture below. Click on picture for bigger view. IMPORTANT :Only the new templates will give you Layouts and Fonts and Colors options. 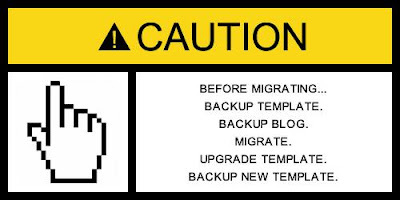 Migrating without upgrading to new template will not give you the new advances. 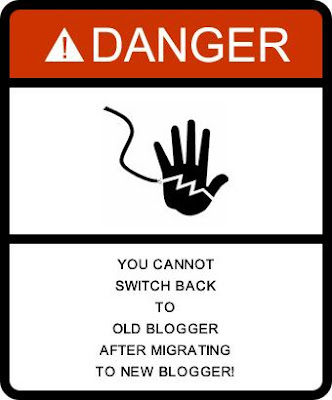 After migrating to new Blogger you cannot switch back to old Blogger. Most of the new features are due to the new templates. Hence if you feel you are having problems you can revert to the Classic Templates. All Blogs are now in the new Blogger. Beta Blogger and the old Classic Blogger no longer exist. What exists now is only Classic Templates and Layout Templates. 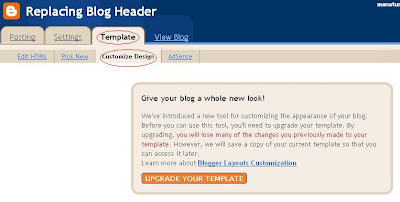 You can switch or interchange from Classic Templates to Layouts in the New Blogger. Enjoy!! For a complete timeline of events leading to New Blogger see Blogger Buzz: Old Blogger is dead! Long live Blogger! 6 VIEWERS CLICKED HERE TO COMMENT ON THIS POST. ADD YOUR COMMENT. do you have to switch? The old blogger is being closed down so you will have to switch one day I am afraid. Old Blogger is dead. Long live New Blogger!! For detailed help use my email address in middle column. i switched and upgraded, but then could not successfully add the site meter, among a few other things that were on my "old" (html template) blog. so i reverted back to the "classic template." i'm pretty sure that when i did, i read that i'd be able to "re-revert" to my "new," (layout) blog. but since i have reverted back to the classic template, i have been trying how to figure out how to get back the "new," revised, blog that i made using "layout," and i can't find out how to.